Lower sales of Apple's iPhone models in some regions of the world have hit the firm's financial performance, but it is bullish on future services revenue. Apple revealed that its revenue from iPhone sales fell 15 percent in the most recent quarter, driving a 5 percent overall drop in the firm's revenue compared to a year earlier. Revenue in the quarter was $84.3 billion, which is around where Apple had cautioned investors it could end up. 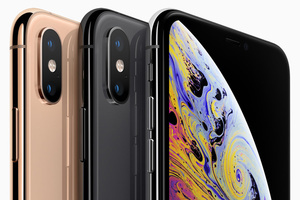 Sales of Apple's iPhones were particularly lower in the greater China region, where overall sales dropped by more than 25 percent during the quarter compared to the previous year. Europe also saw a 3 percent drop in overall sales for the Cupertino giant. While acknowledging the drop in hardware sales, Apple is very optimistic about its revenue in services. During the same quarter, its services revenue rose 19 percent to a firm record of $10.9 billion.